Hi, I’m Amy Smart and I like to share my quilting adventures at my blog Diary of a Quilter. 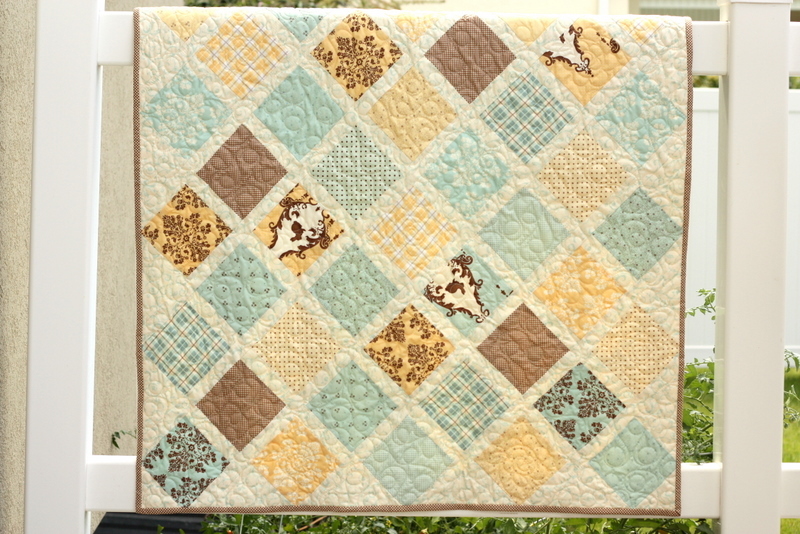 I’m excited to share a tutorial for a sweet little baby quilt using a couple of Charm Packs and a contrasting sashing fabric. 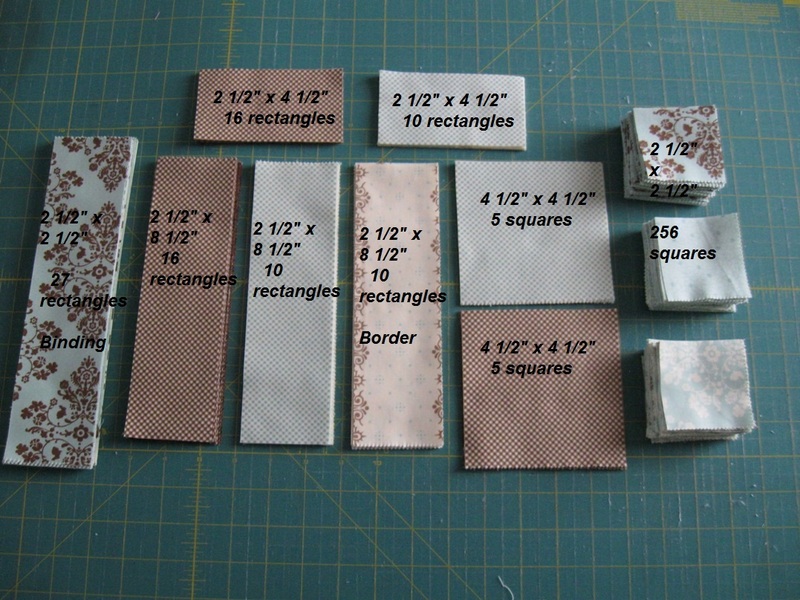 Collect (50) 5″ squares from either 2 Charm Packs or a Charm Pack + (8) 5″ squares from a coordinating Fat Quarter or two. 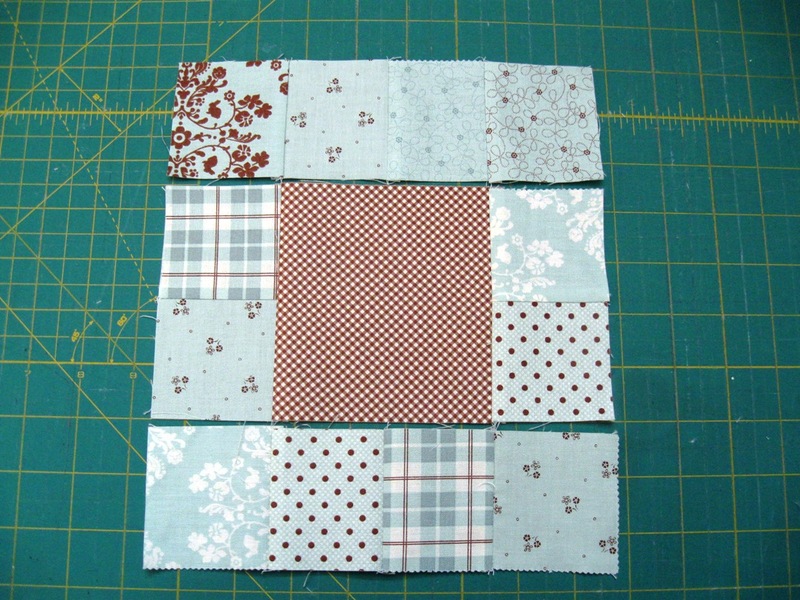 From one of the 5″ x wof strips, cut (2) 4 1/8” squares. Cut each square once on the diagonal. You will have (4) corner-setting triangles. Subcut 7½” strip into (5) 7½”squares. Cut squares twice – once on each diagonal to get (4) triangles per square, for a total of (20) triangles – reserve for side setting triangles. 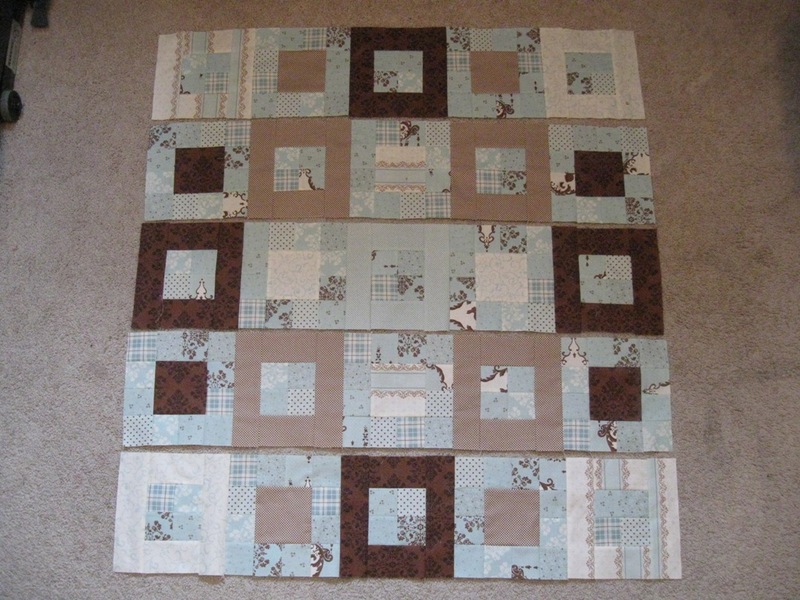 Using the (50) 5″ squares, layout the squares on point starting with 5 squares across and 6 squares down (see photo below) until you get a design and balance of color that you like. 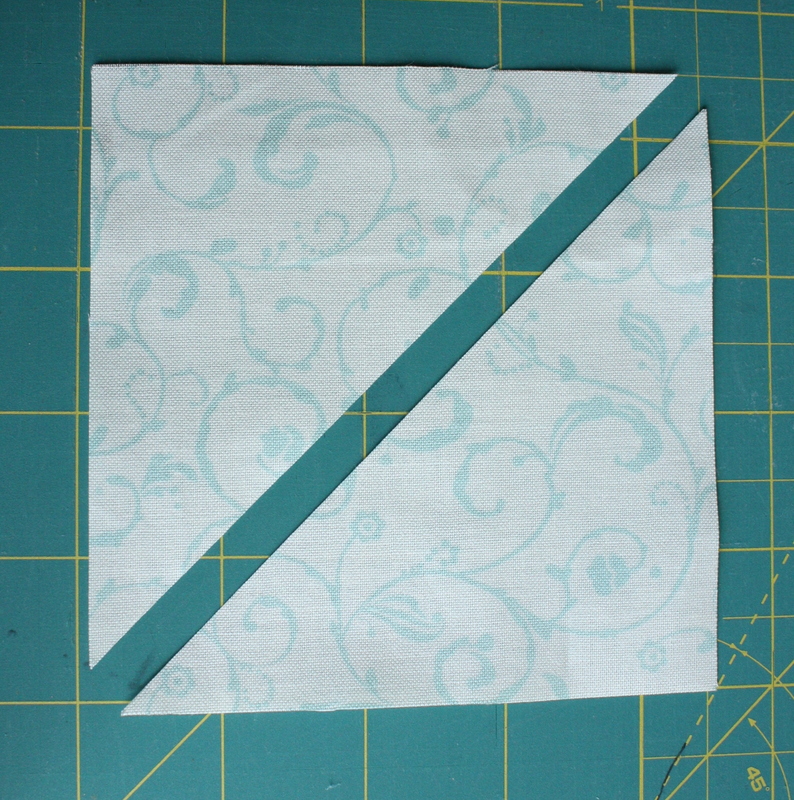 When sewing side-setting triangles to the ends of the squares, line up the 90 degree corner with the bottom corner of the square. You will have the top tip of the triangle hang longer than the top corner of the square. 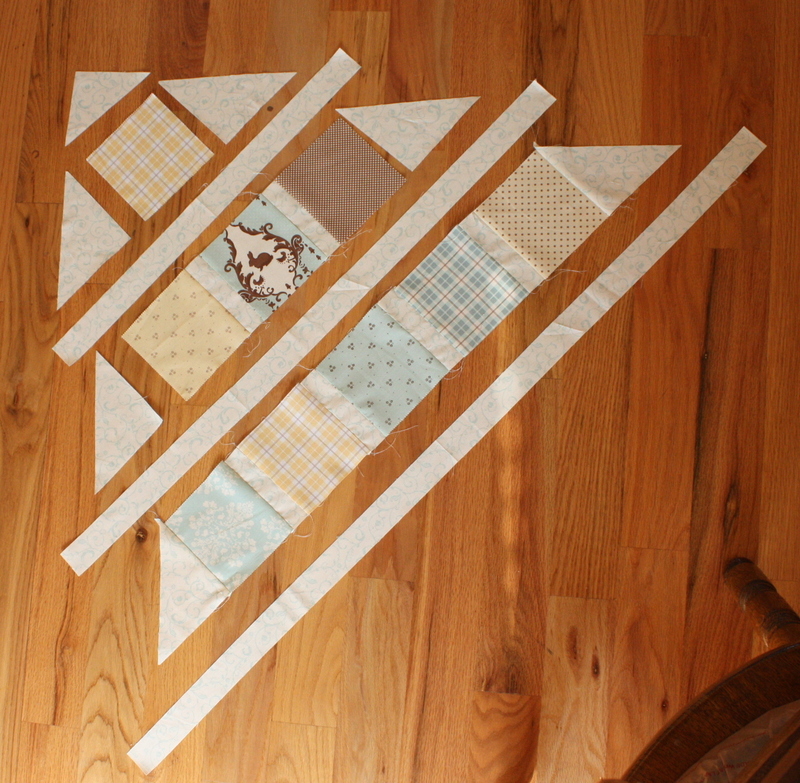 When sewing a corner-setting triangle to the end of a row, center the longest side of the triangle with both points hanging over the corners of the matched-up square. Sew right-sides together. 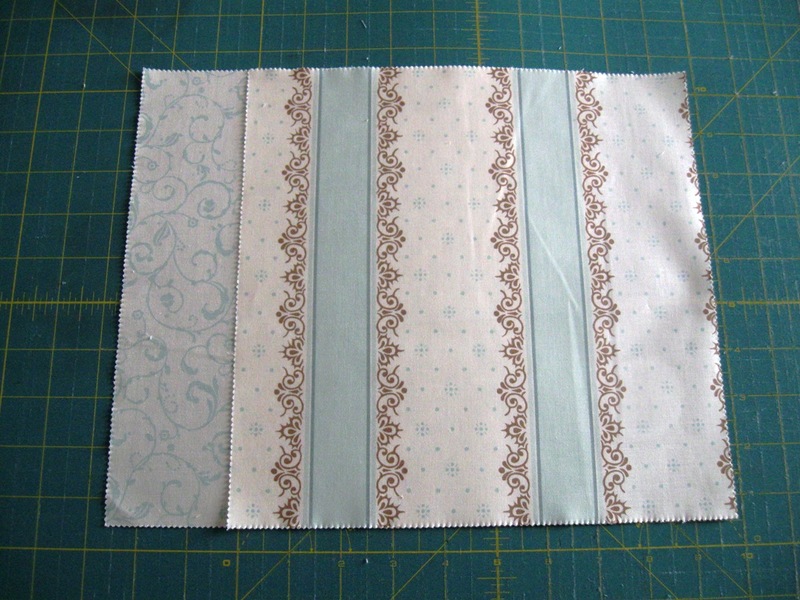 Take the (10) 1½” x wof sashing strips and trim or sew strips to a generous length to sew between the pieced rows. 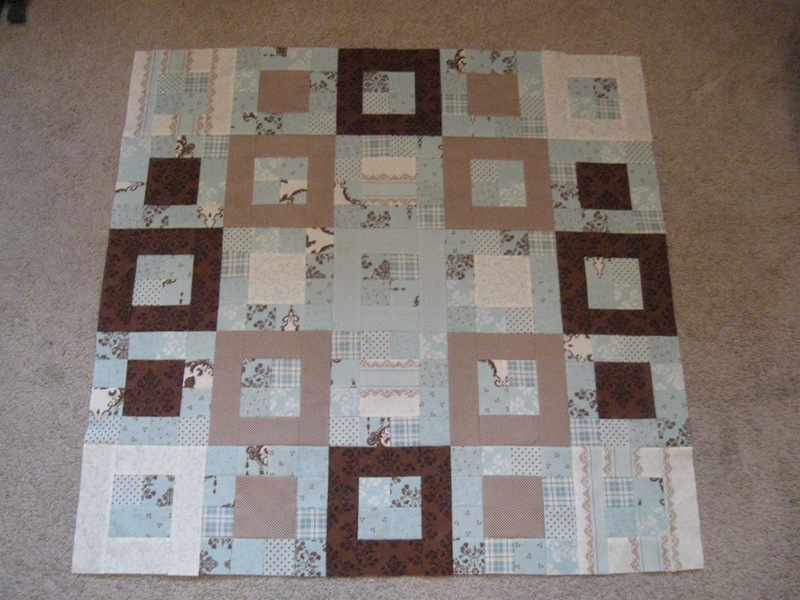 Begin to assemble pieced rows with a sashing strip in between. 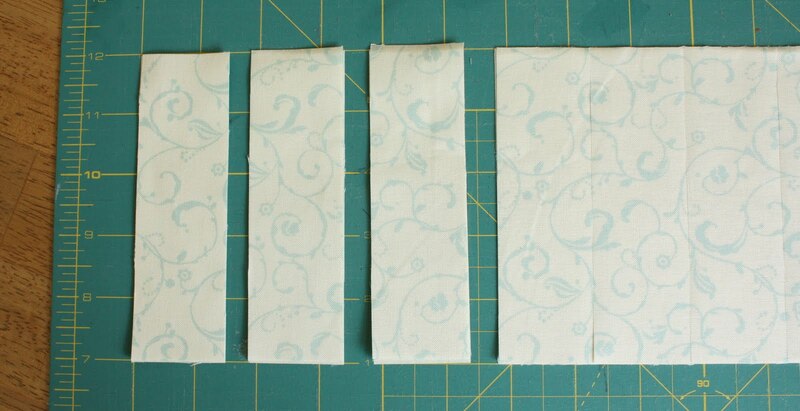 Leave about 2″ of strip at the end of each row. 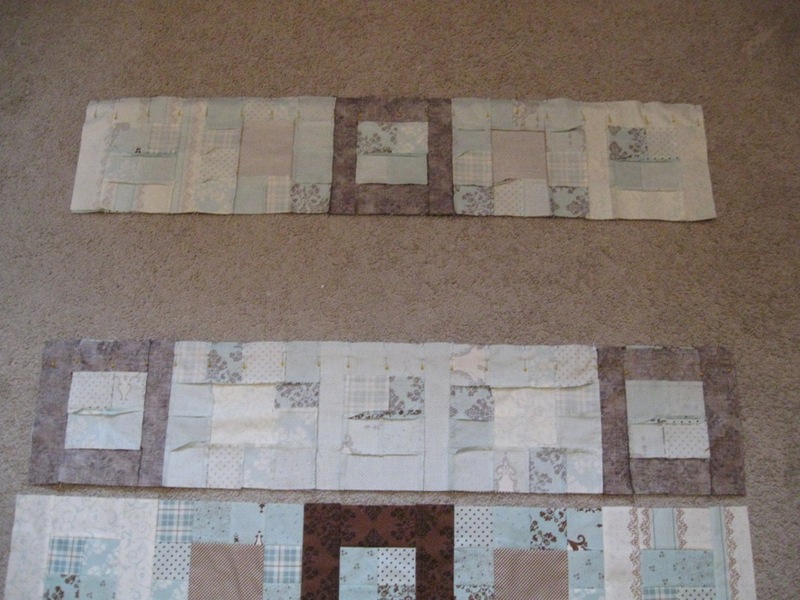 In order to make sure the side-sashing strips match up when assembling the rows together, place the row with the long-sashing strip sewn to it on the bottom with the row to be attached right-sides together. 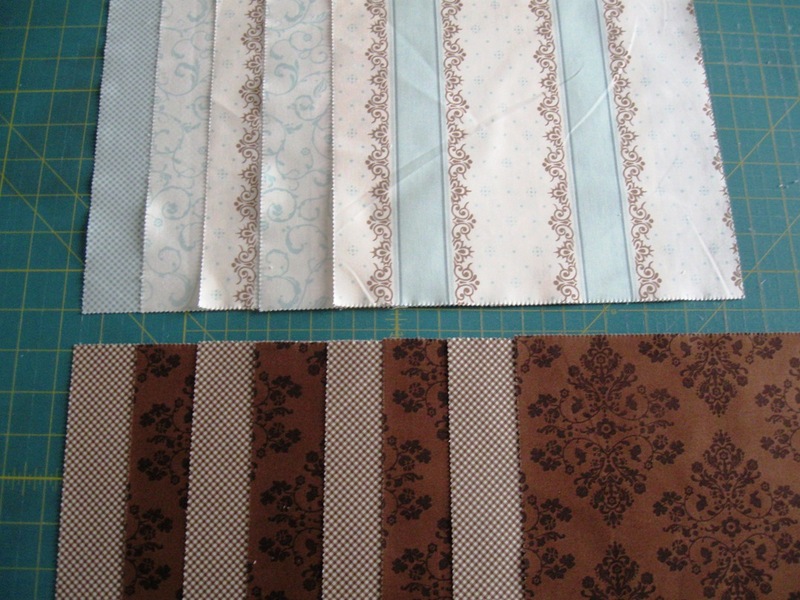 Fold back the top row and make sure the side-sashing segments are lined up. 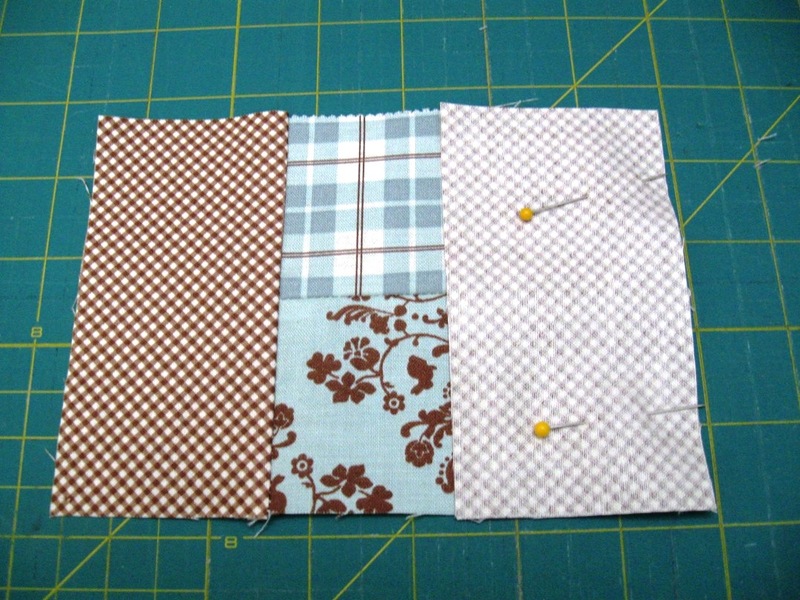 Carefully fold the top row back so that they are right-sides together and pin the two rows together to hold them in the correct place for sewing. 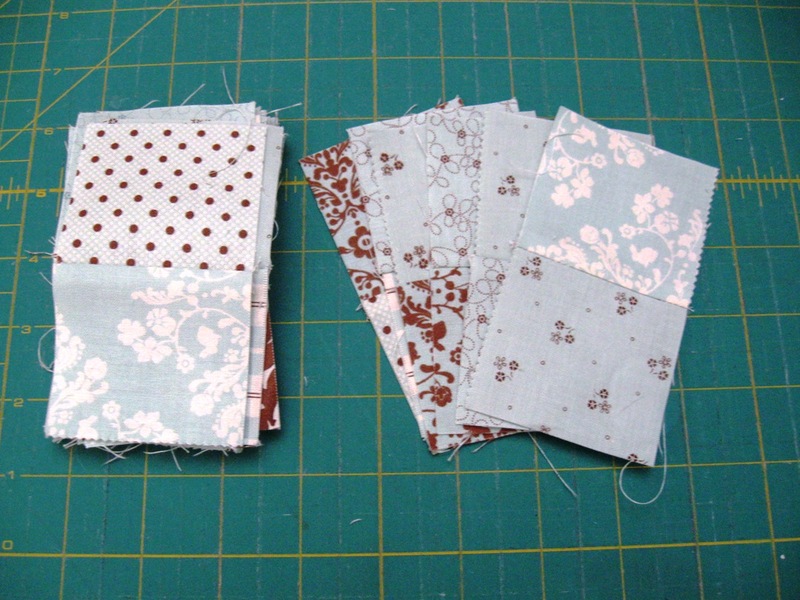 After sewing rows together, press seams towards the sashing strips. 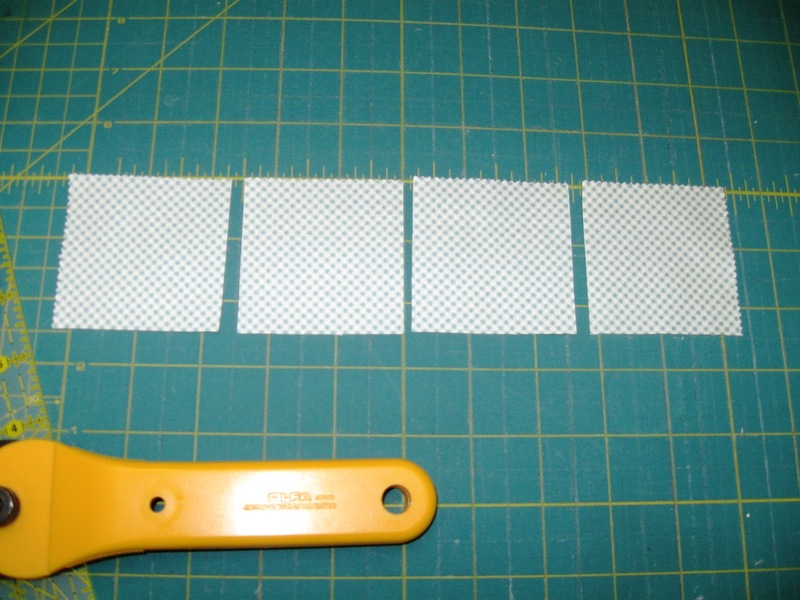 Carefully square-off the sides using a long ruler. 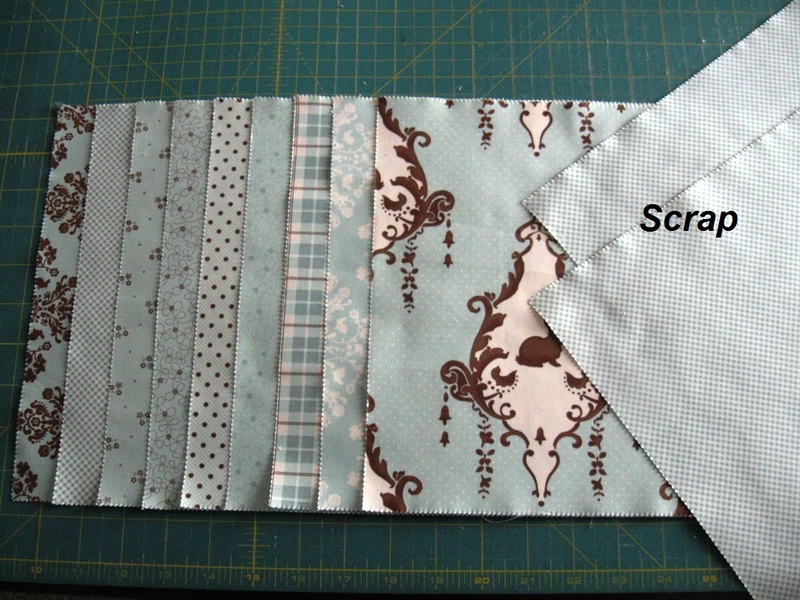 Make sure to leave a ¼” seam allowance at the corners of the charm squares. 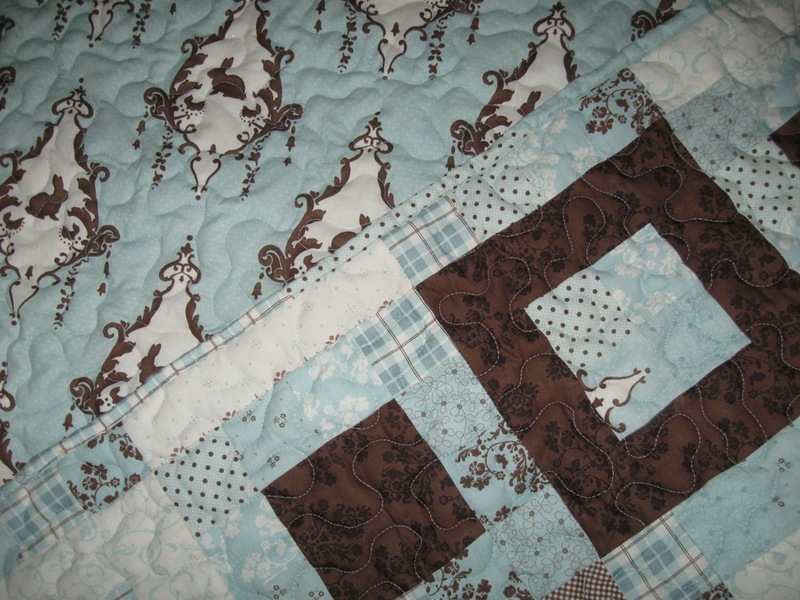 Square-off corner-setting triangles using the quilt’s sides as your guide. Be careful to keep the corners square. 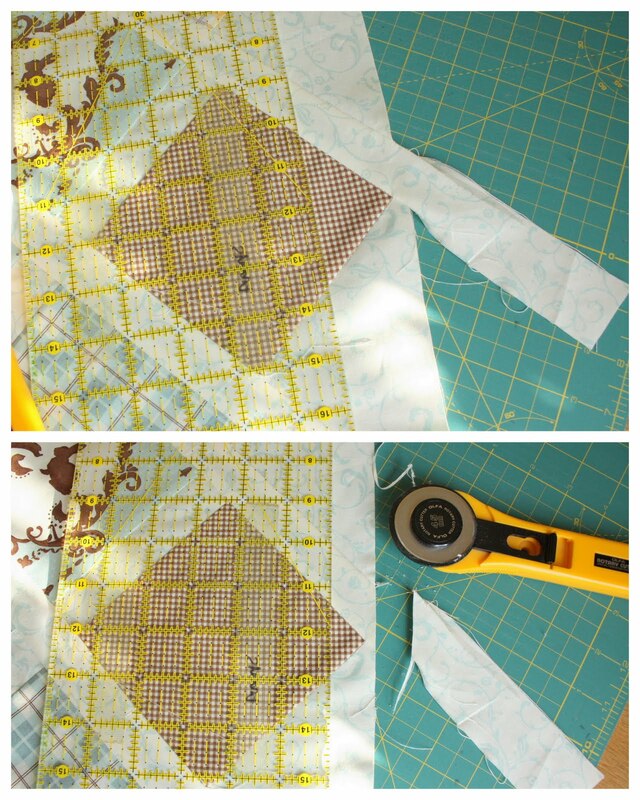 Quilt using your favorite method (or quilter.) My friend Meridee Palmer quilted this one for me. 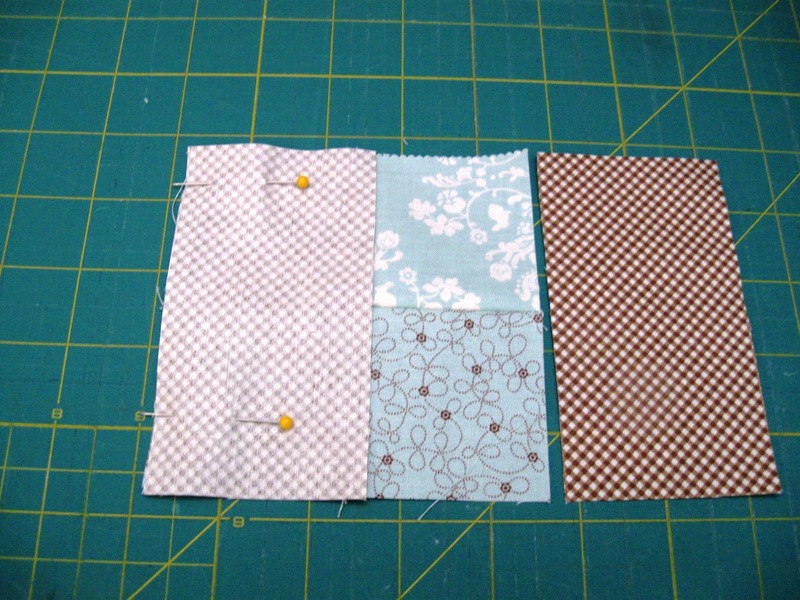 Binding: Sew (4) binding strips together end to end. 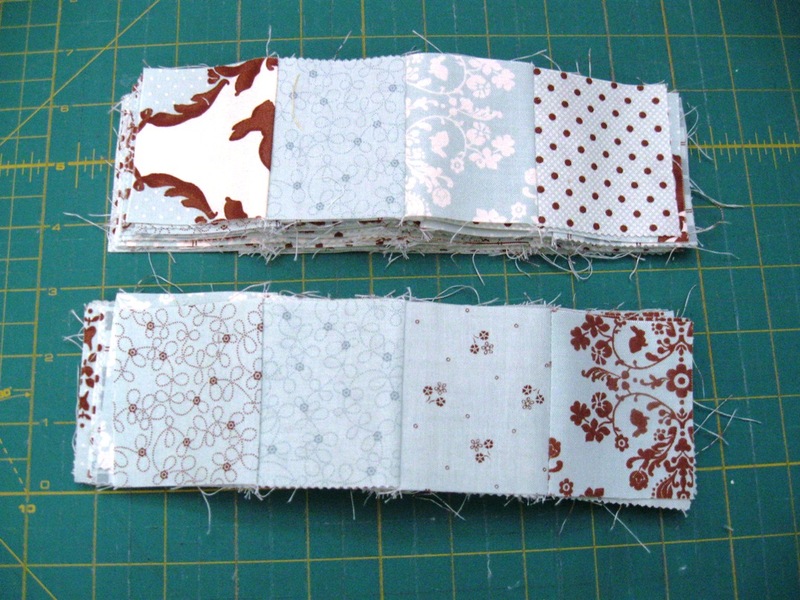 I use this binding method for finishing this quilt. 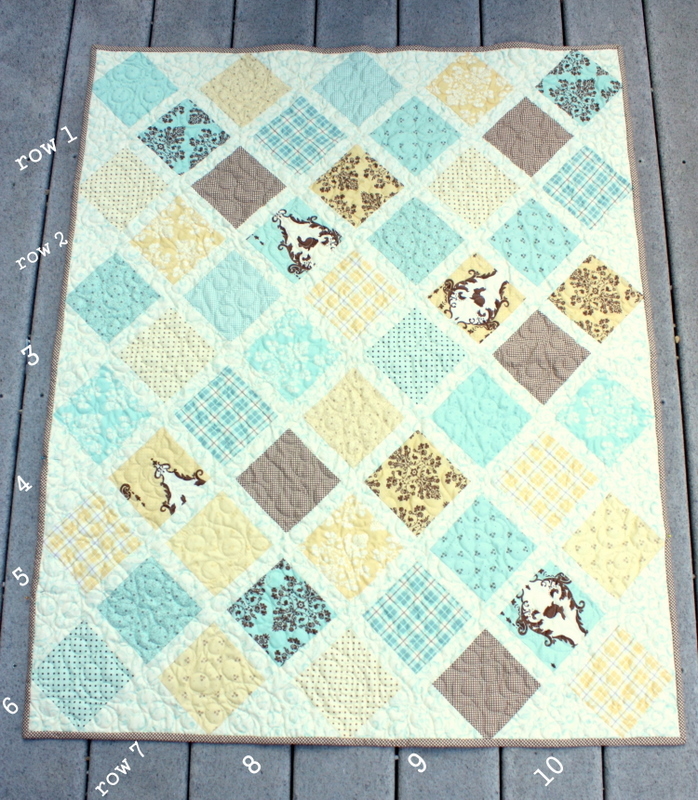 One pretty 36″ x 48″ quilt for your favorite new baby. This quilt is for my brand new niece. 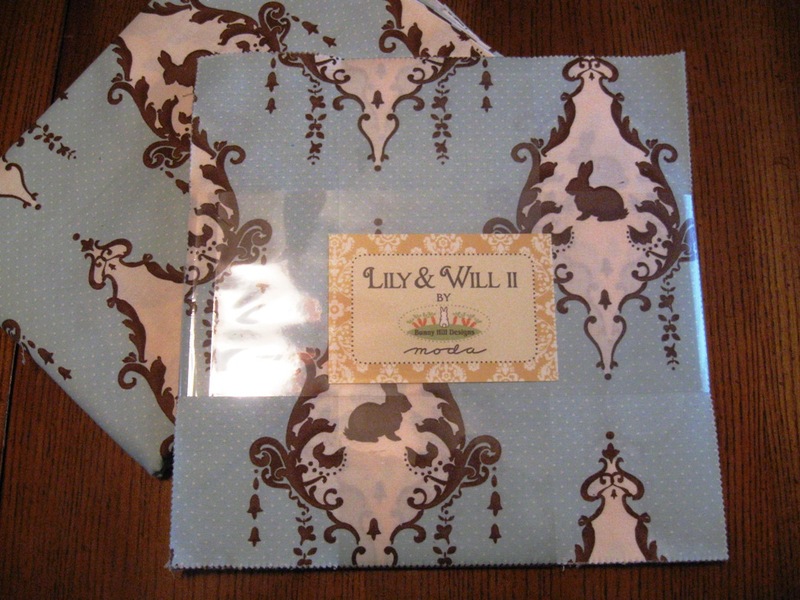 Since the Lily and Will II fabrics that I used may be more scarce now, may I suggest Anne Sutton’s newest collection, Puttin’ on the Ritz as the perfect substitute. 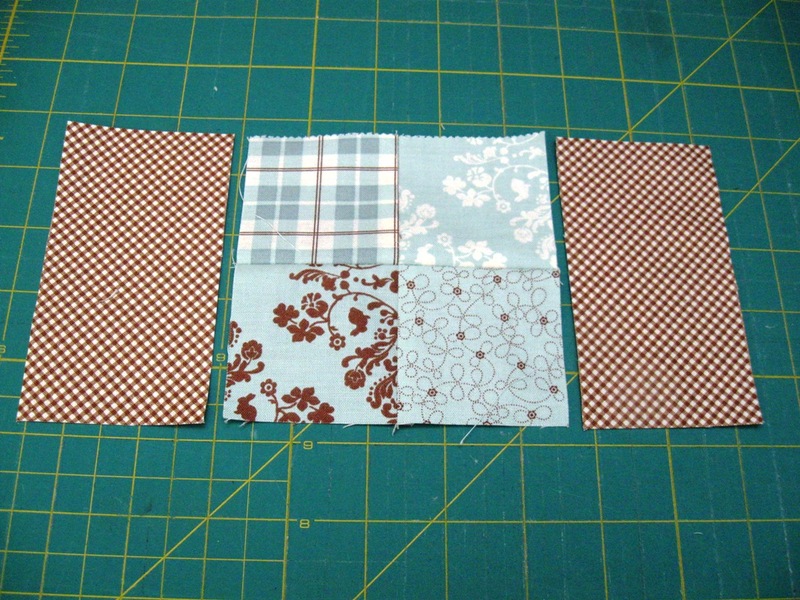 There’s even the same gingham printed on the bias… perfect for the binding. 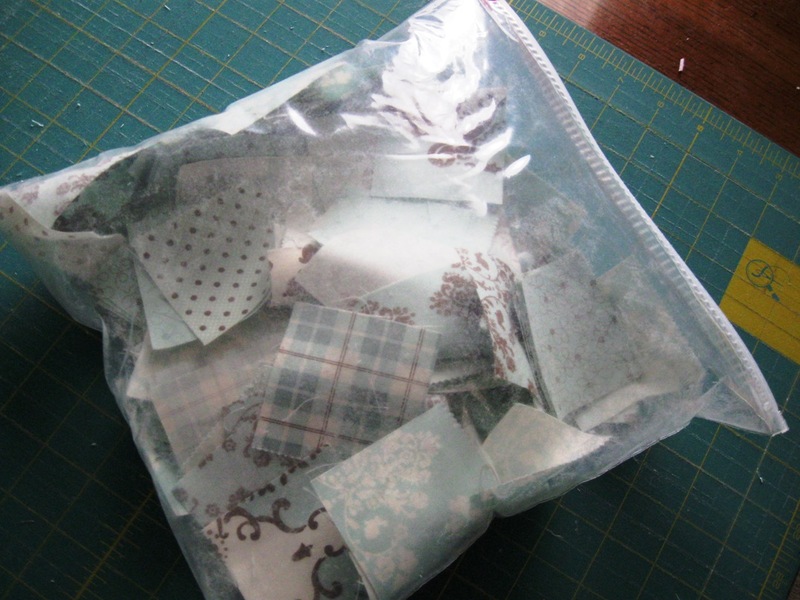 I hope you enjoy this fun little project – perfect for using all the sweet Charm Packs that are available right now. 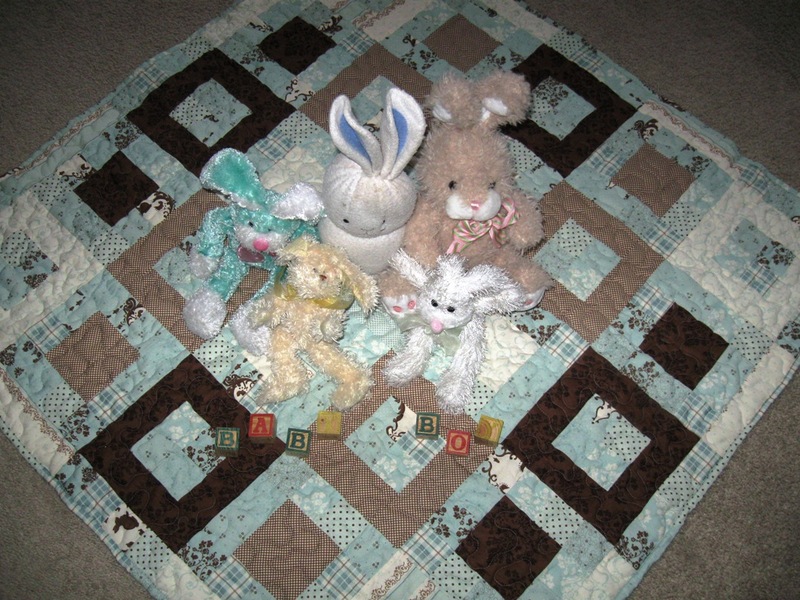 Do you have a sweet little bundle of joy you could make up some snuggly squares for? 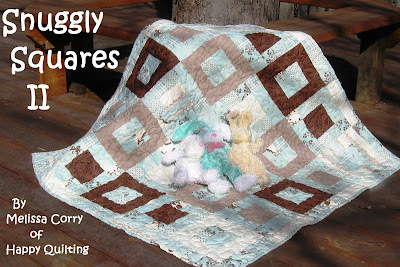 Well then pop on over to Burgundy Buttons where Leah has made up a Snuggly Squares II Quilt Kit just for you. They come in Aqua or Yellow. 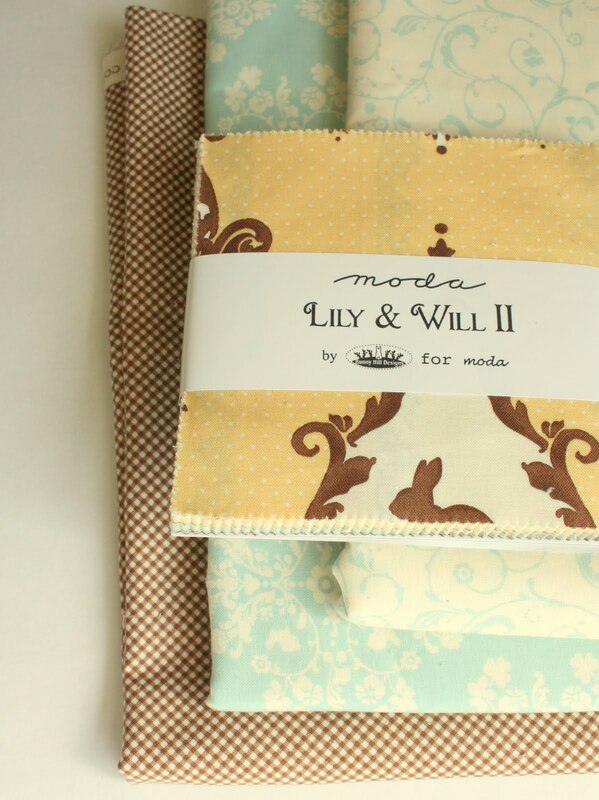 And each even come with an adorable quilt label to add to your finished product. How awesome!! 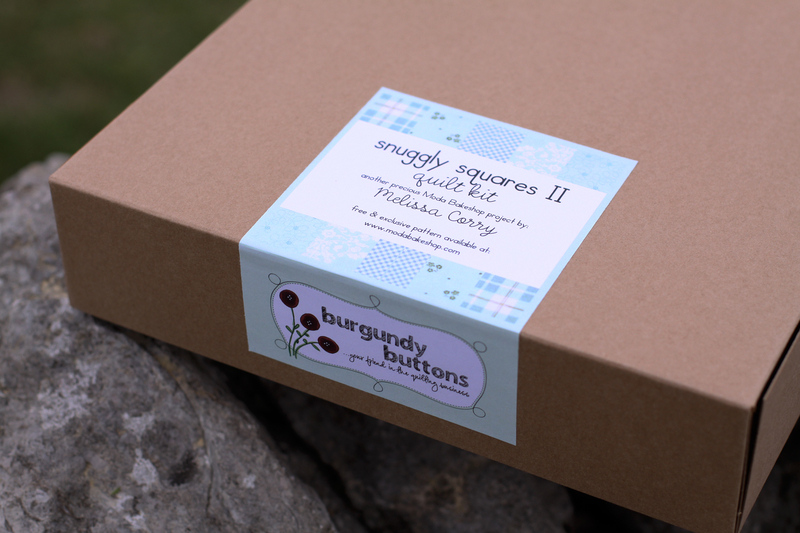 And as usual, they are at a great Burgundy Buttons discount price. So hurry over, quantities are limited. Okay, grab your layer cake and take off the packaging 🙂 Isn’t it just fun to see all of those amazing prints and colors!! Now gather up the 5 following white-ish pieces of cake, and the 8 following brown pieces of cake. (Ya, I call teh 10 x 10 square a piece of cake, I figure it fits 🙂 Got em?? Great!! 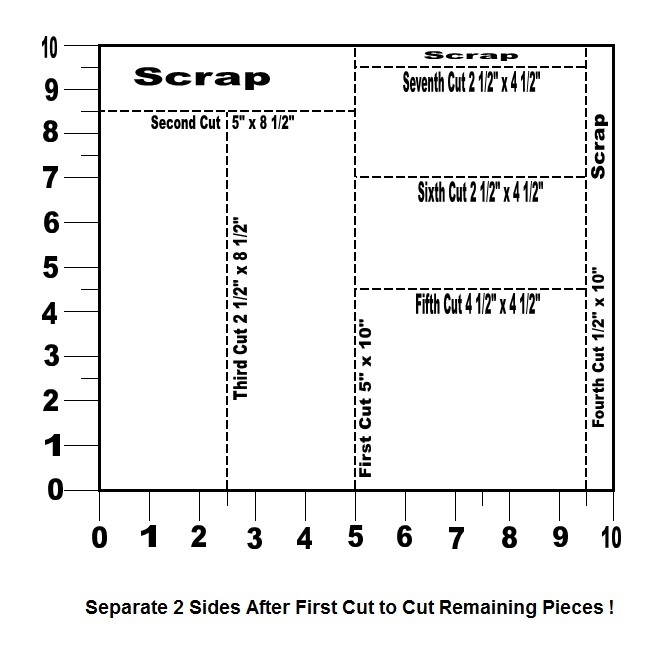 Use this guide to slice up those 2 pieces of cake. They are a little easier to cut 🙂 Make sure to cut the top first so that you have 1 larger piece of scrap instead of 4 little ones. 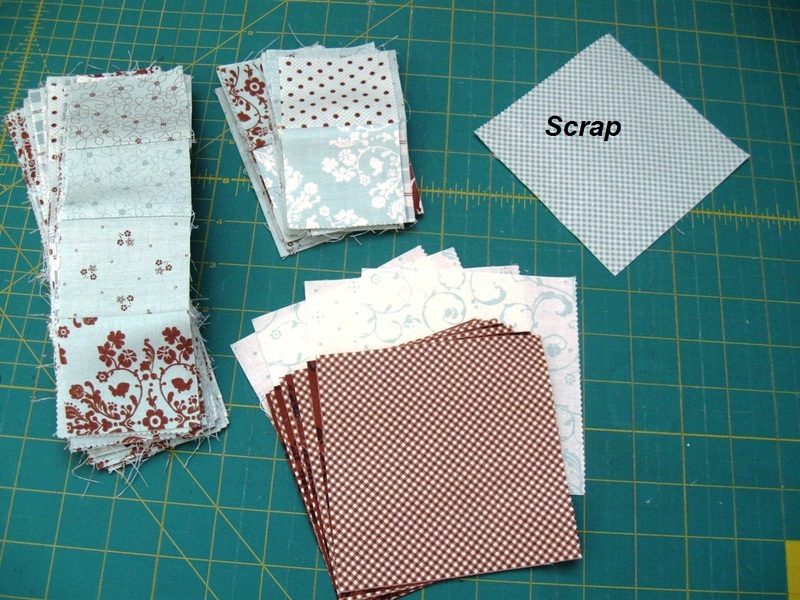 Everyone likes bigger scraps. Gather up 2 slices of bluish cake of each of the following 8 prints. You will have a total of 18 squares. 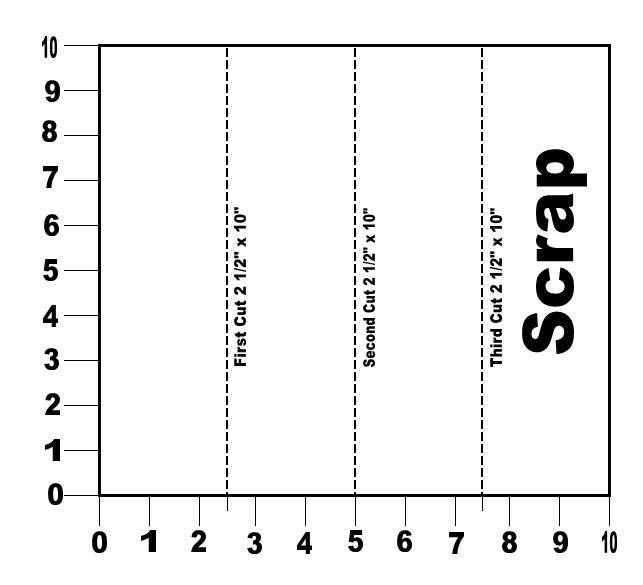 You should have 11 pieces of cake left 🙂 The 2 repeat pieces of blue and white checks can be set into your scrap pile. So now you are cutting with 9 pieces of cake. 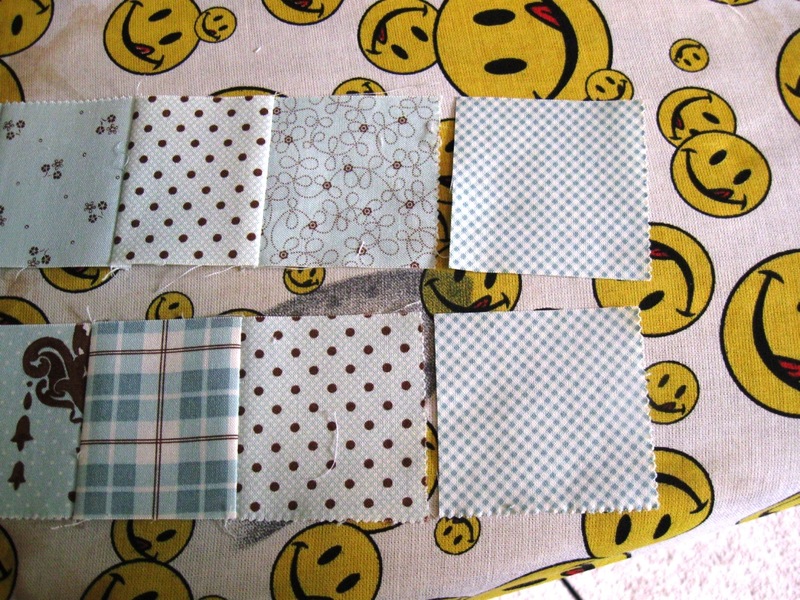 We are going to be turning all of those individual squares into 2 patch pieces. 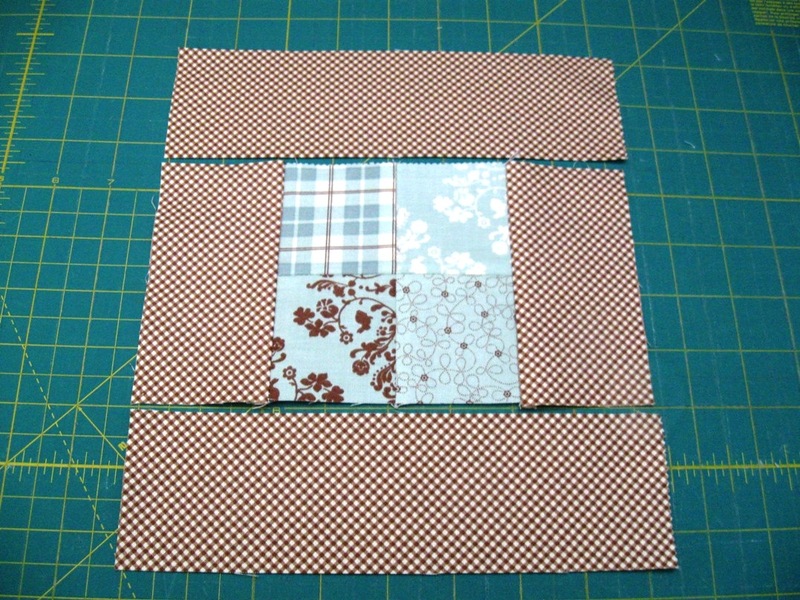 Grab 2 squares out of the bag (Check to make sure they are not the same print 🙂 and place them right sides together. Stitch a 1/4″ seam along the edge. Doesn’t matter which edge, any will do 🙂 Once you have completed one, don’t pull it out of your machine. 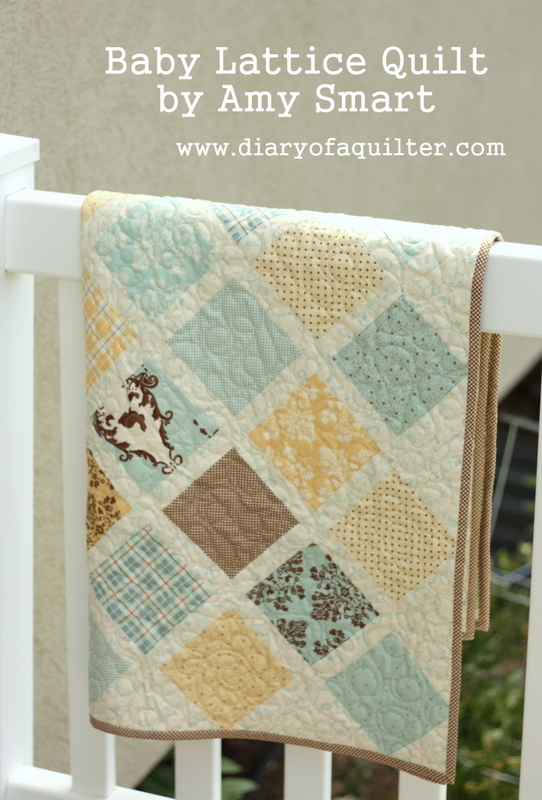 You are going to chain stitch all of your squares. Keep feeding them through, one after another, until you have made all your squares into 2 patch pieces. You should have 128 sets. Clip the threads between your sets and press your seams. I just press mine in one direction but if you like open seams, you are welcome to do it that way. So now you have a large stack of 2 patch pieces. We are going to play with them some more. Next we are going to make 36 four patch rows. Grab 72 two patch pieces. 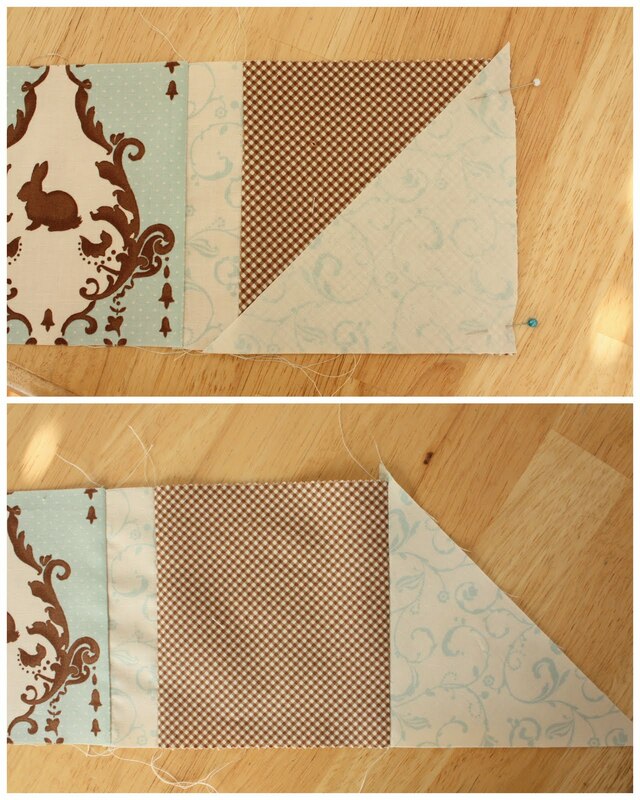 Lay 2 sets right sides together and pin along the edge. Repeat for all 36 sets. So now we are going to make 13 four patch squares. Grab 26 two patch pieces. 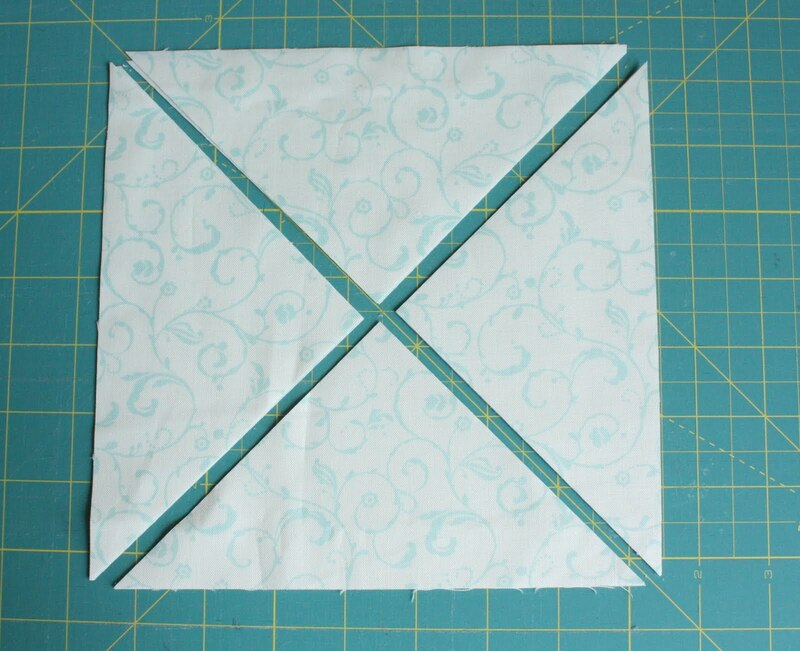 Lay 2 sets right sides together and pin along the center edge. Make sure to nest your center seam. Repeat for all 13 sets. This is the layout to start. 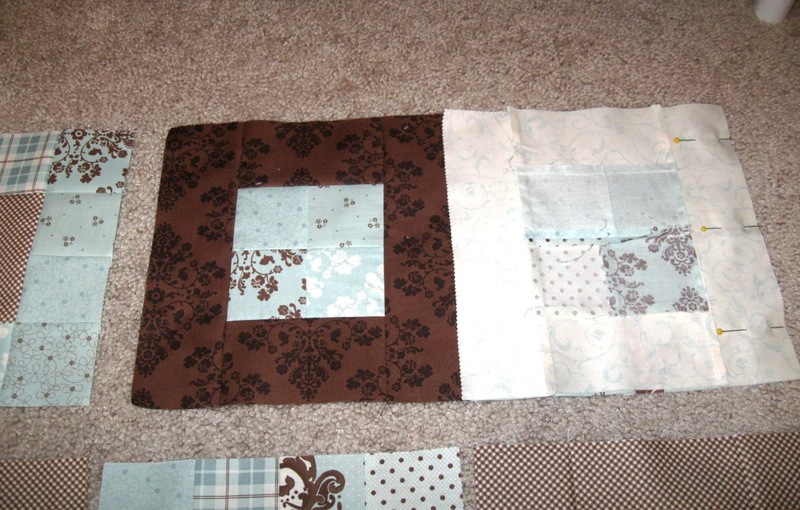 We will be attaching a 2 patch piece two opposite sides of your center square. 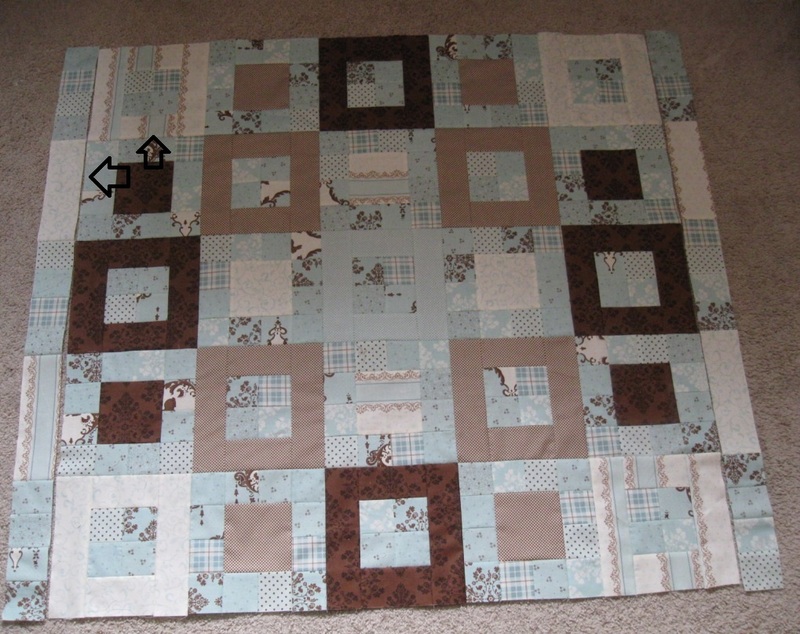 Lay the first 2 patch piece on the center square with right sides together and pin. Repeat this process with all 12 of your sets. 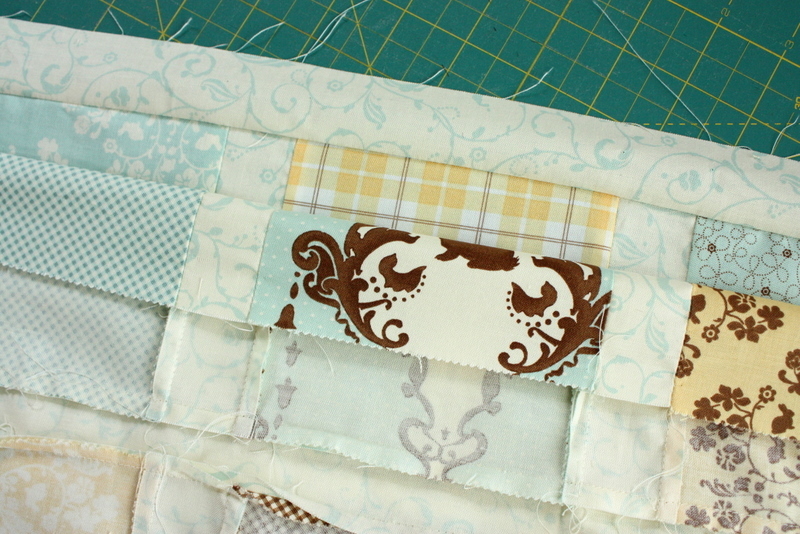 Chain stitch a 1/4″ seam along your pinned edge of all 12 sets, clip your threads and press . So now you are here. Onto attaching the second side. Same process. 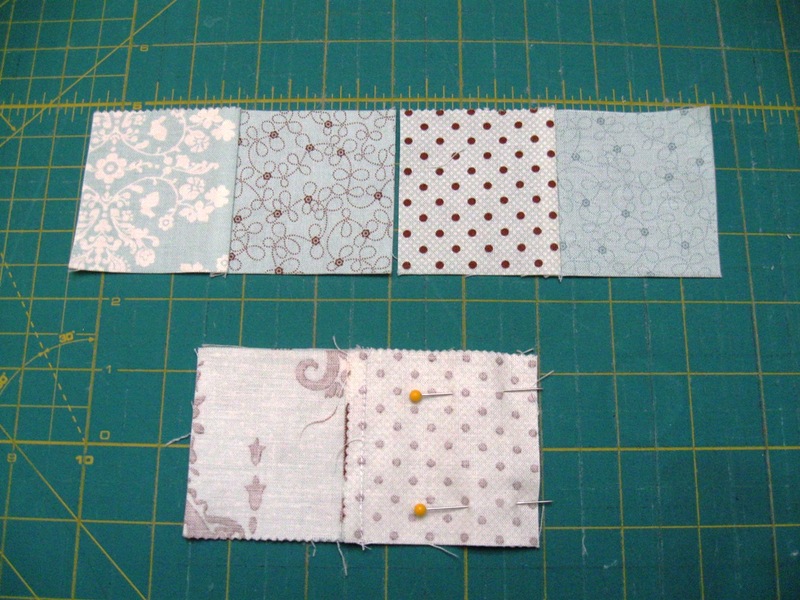 Lay your pieces for all 12 sets right sides together, pin, chain stitch a 1/4″ seam, clip threads, and press. With those 2 sides attached, you are ready to add the top and the bottom. Grab your 4 piece rows. Now, onto Block B. 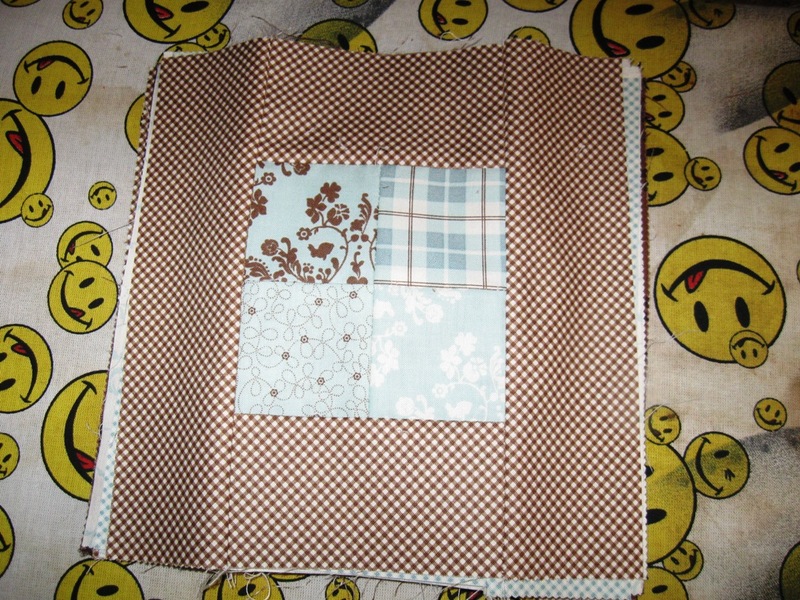 We will be making 13 of these 🙂 Gather your 4 Patch Squares, and your brown and whitish sashings (those are the rectangles you cut in the first cutting step). 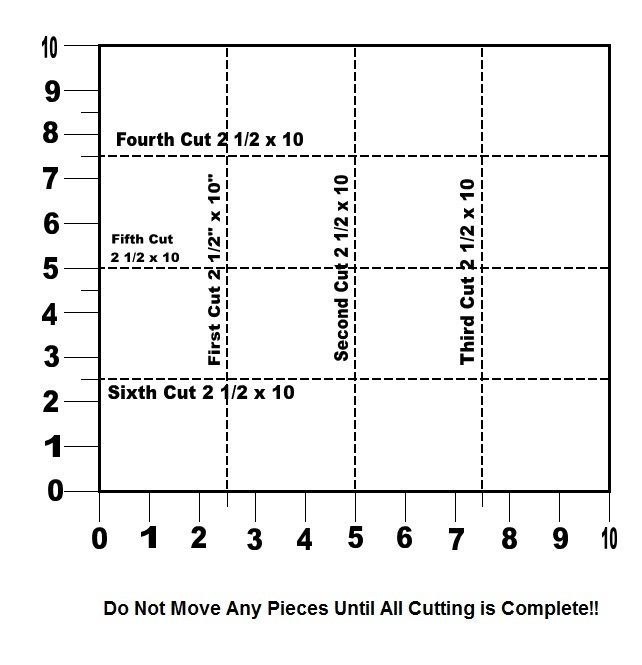 These are put together in the same manner as Block A so this should be cake 🙂 The one difference now is to make sure that you are always adding the same print of sashing 🙂 So grab 2 of your 2 1/2″ x 4 1/2″ rectangles in the same print and layout as follows. 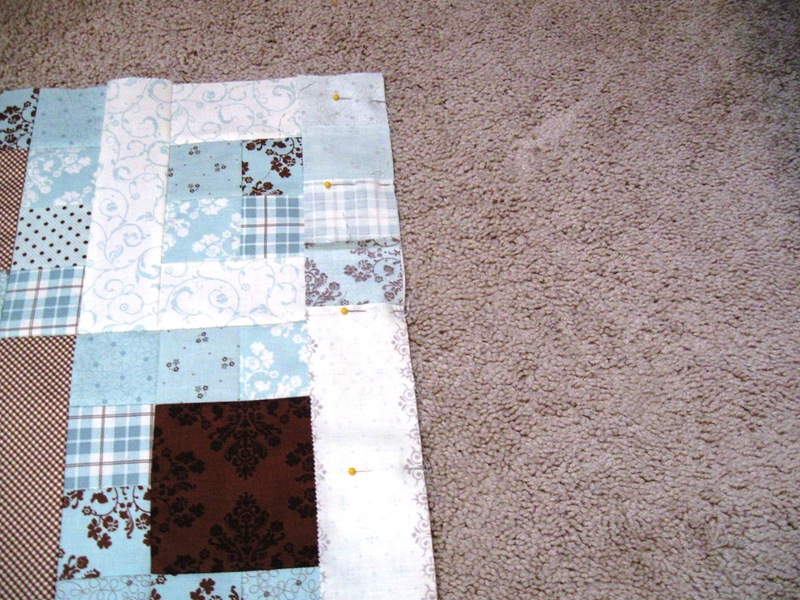 Lay your first side onto your pieced center square and pin. Repeat with all 13 sets. Chain stitch a 1/4″ seam, clip threads, and press. Now onto the second side. Once again, double check that you are adding the same print to each set. 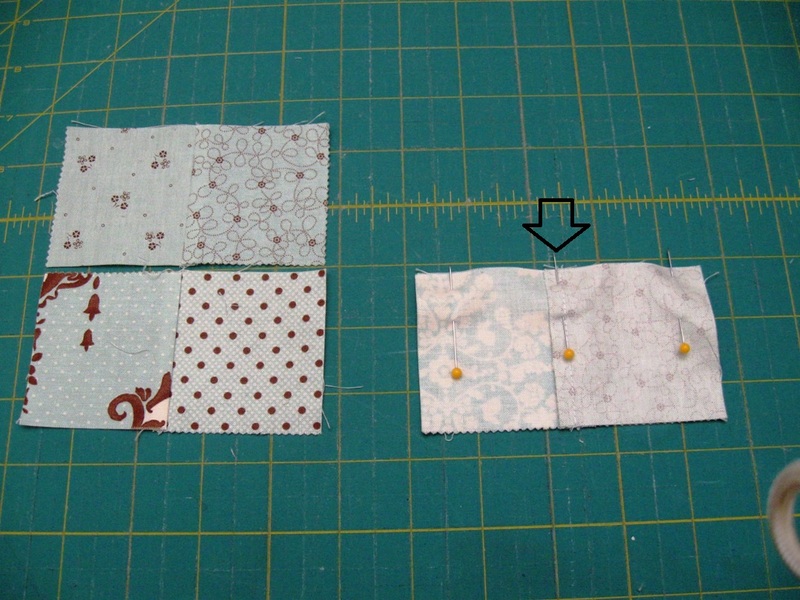 Pin with right sides together, chain stitch your 1/4″ seam, clip threads and press. Now it is just adding the top and bottom. This is easy by now 🙂 Grab your 2 1/2″ x 8 1/2″ rectangles that are matching prints. Do this for each of your 13 sets. And now you have 13 Block B’s. Super adorable and super easy!! Once you have your blocks all laid out you are ready to start putting together your rows. Start with row 1. Lay Block 1 onto Block 2 and Block 3 onto Block 4 with right sides together. Go ahead and pin along the center edges. Sew a 1/4″ seam along your pinned line (and remember to remove pins as you go, no sewing over pins 🙂 Now go ahead and press your seams. 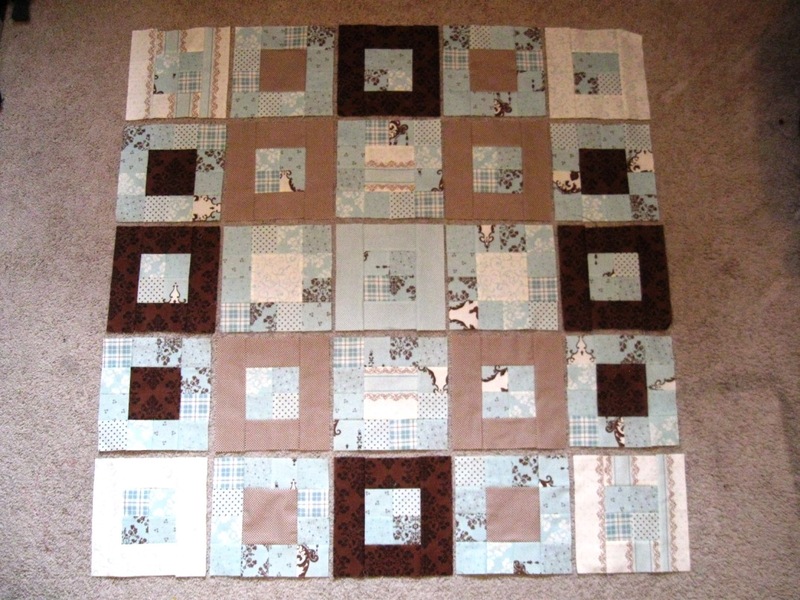 Now you are going to attach block 5 to your now sewn together block 3 and 4. So lay block 5 onto block 4 with right sides together. Pin along the edge. 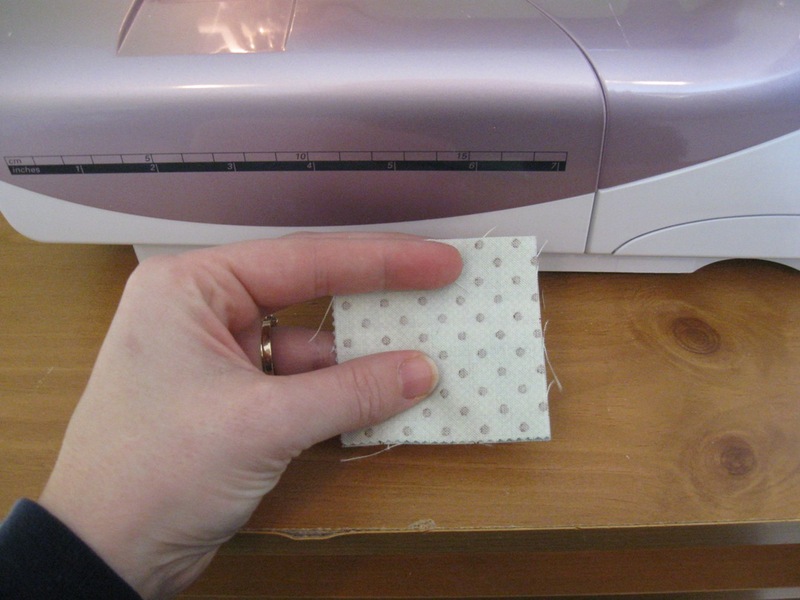 Sew your 1/4″ seam and press. Almost done with the row 🙂 Lastly, lay your sewn together Block 1 and 2 onto your now sewn together Block 3, 4, and 5 with right sides together. 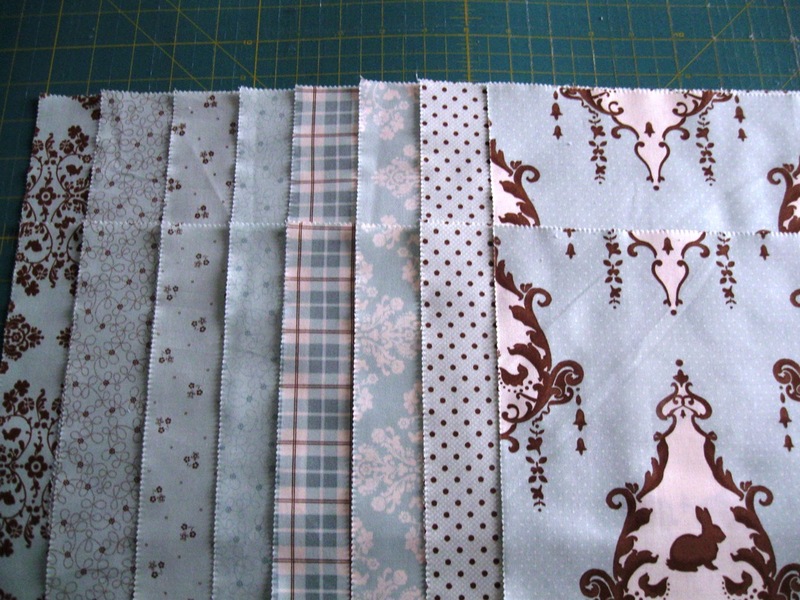 Pin along the edge of Block 2 and 3 to create your final seam. 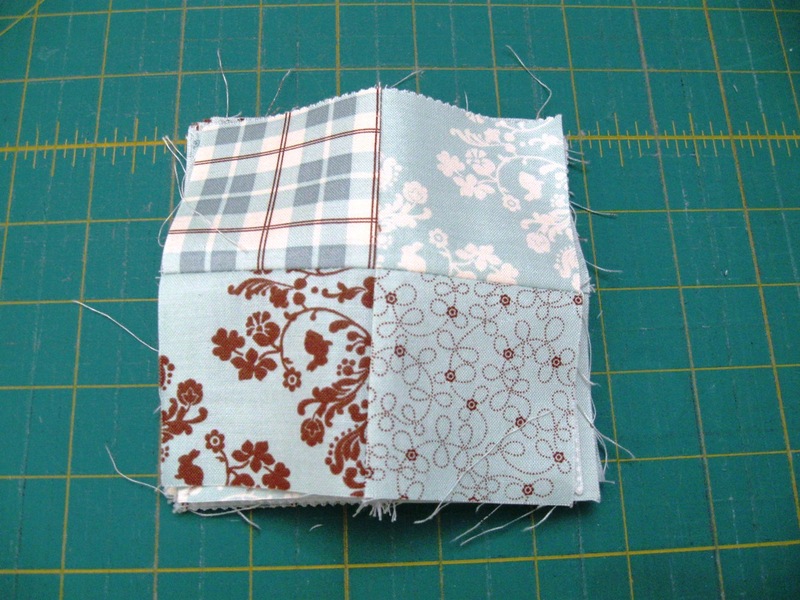 Sew 1/4″ seam along the pin line and press. 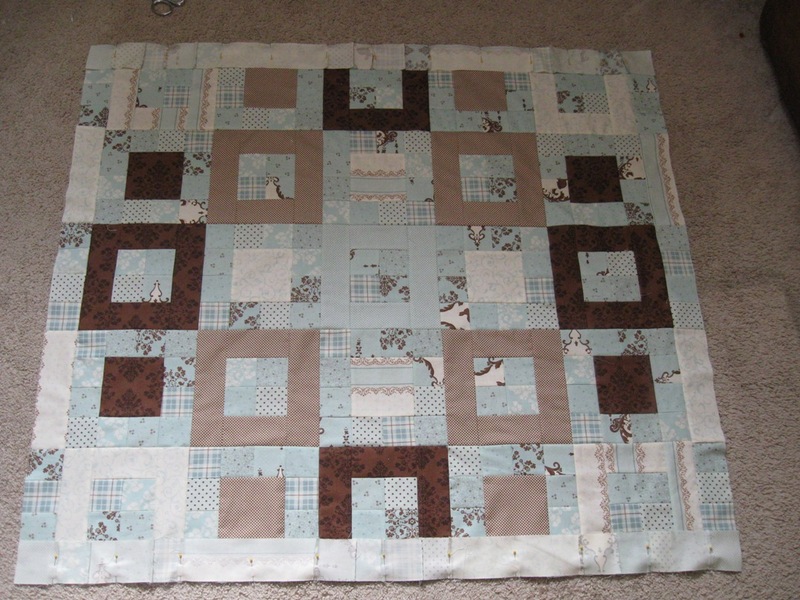 This is what your top should look like with all of your rows sewn. Next you will take the rows and sew them together. This is just like before but on a longer and larger scale. Lay row 1 onto row 2 with right sides together. 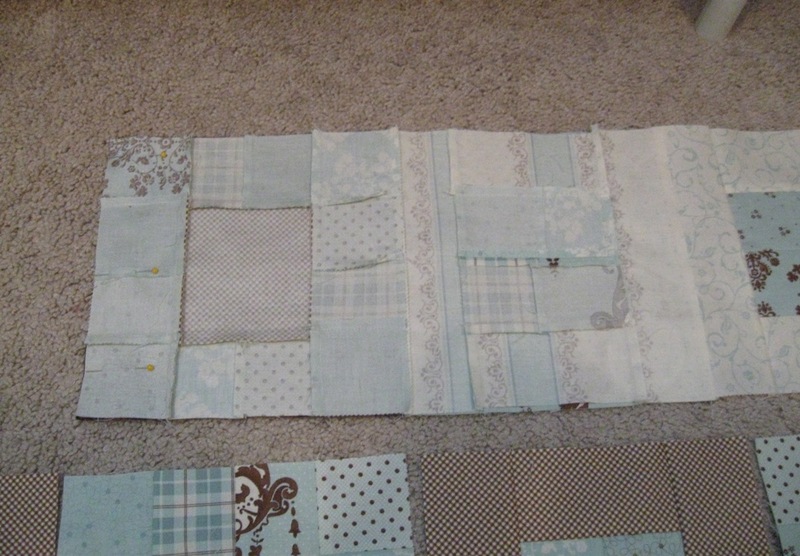 Lay row 3 onto row 4 with right sides together. Make sure to line up the seams. There are lots so use lots of pins. 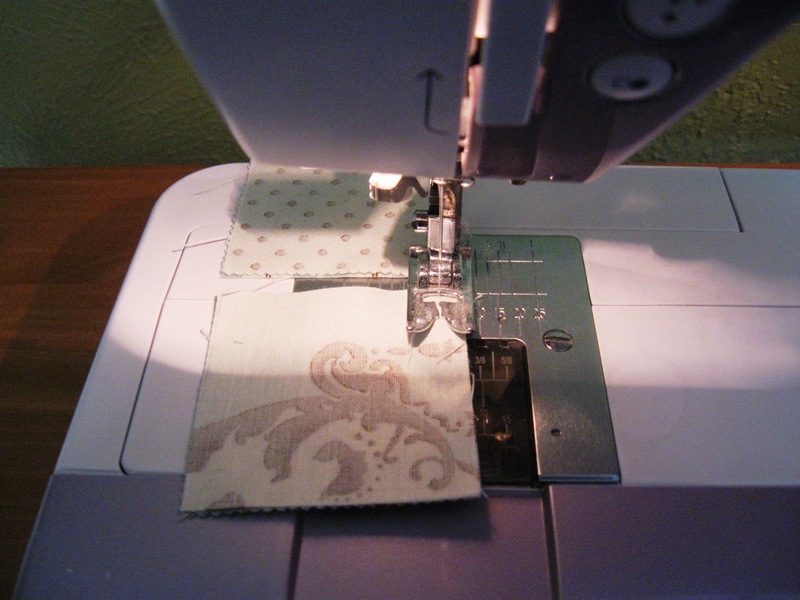 Sew your 1/4″ seam along your two pinned lines and press. 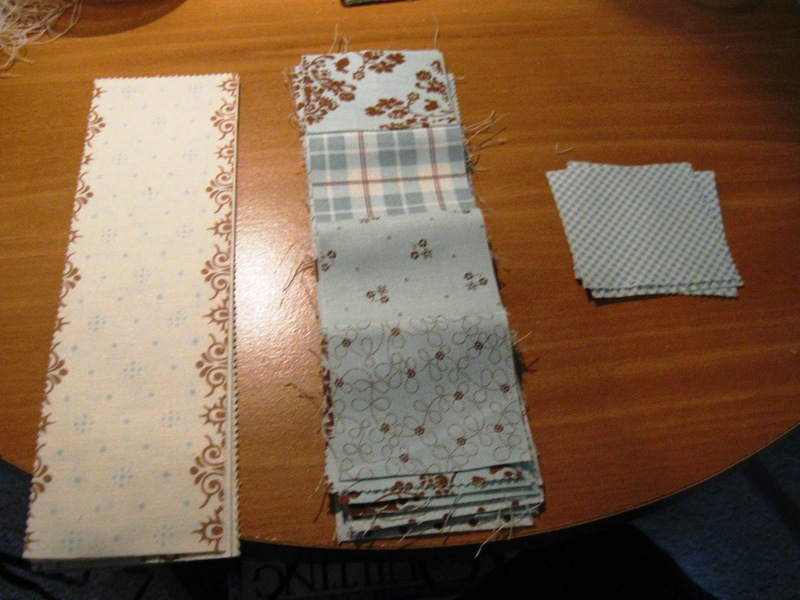 Now repeat the same process by first laying row 5 onto the now sewn together row 3 and 4 with right sides together. 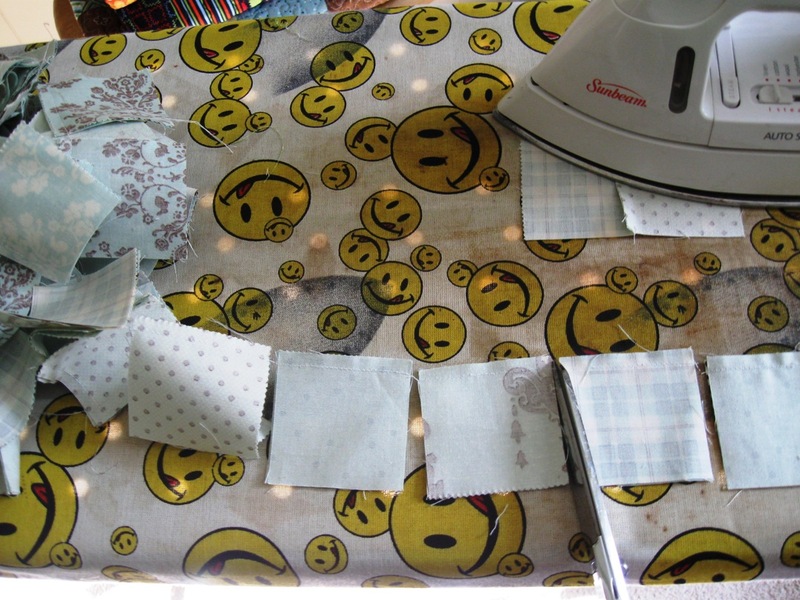 Line up your seams, pin, sew, and press. Then last but not least. 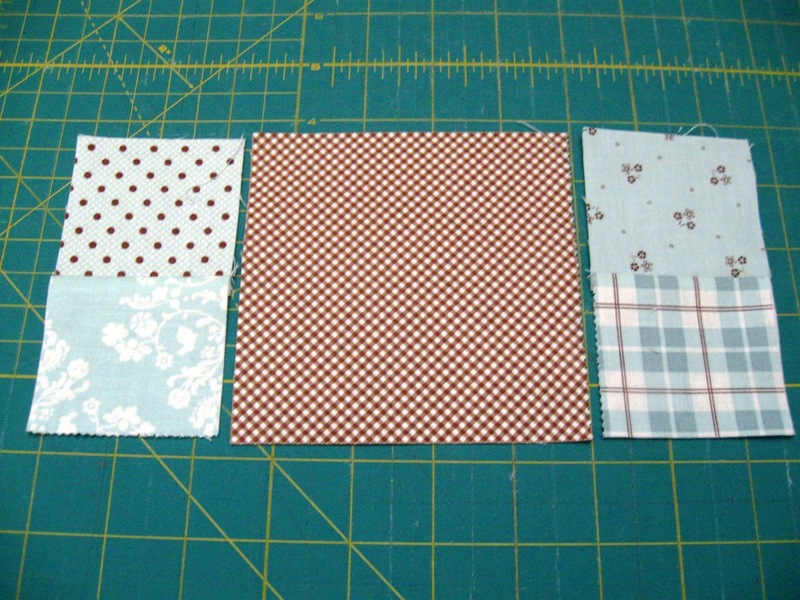 Lay your now sewn together rows 1 and 2 onto your now sewn together rows 3, 4, and 5, pin, sew, and press. You just have to add the border and you are done with the top 🙂 Yippee Skipee! To start, we have one more cutting step. Sorry, I totally spaced this when I was cutting the first time. Remember that one scrap strip of blue and white checks that I told you to set aside? Well pull it out. 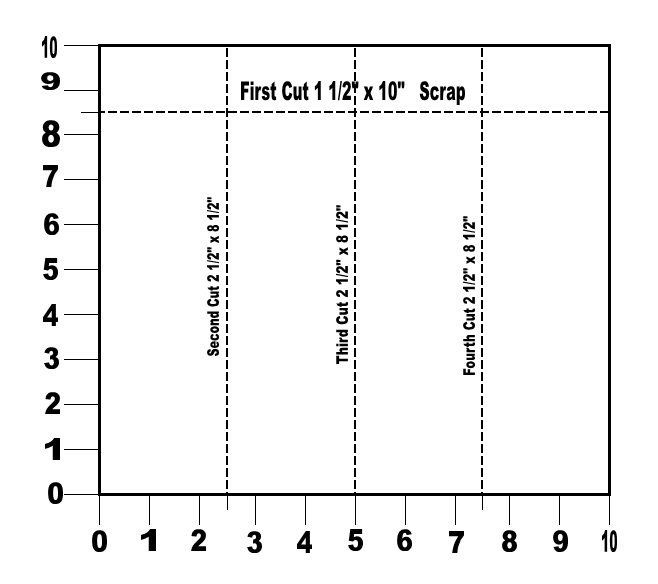 Go ahead and cut it into (4) 2 1/2″ x 2 1/2″ squares. Grab all the bits and pieces for your borders. 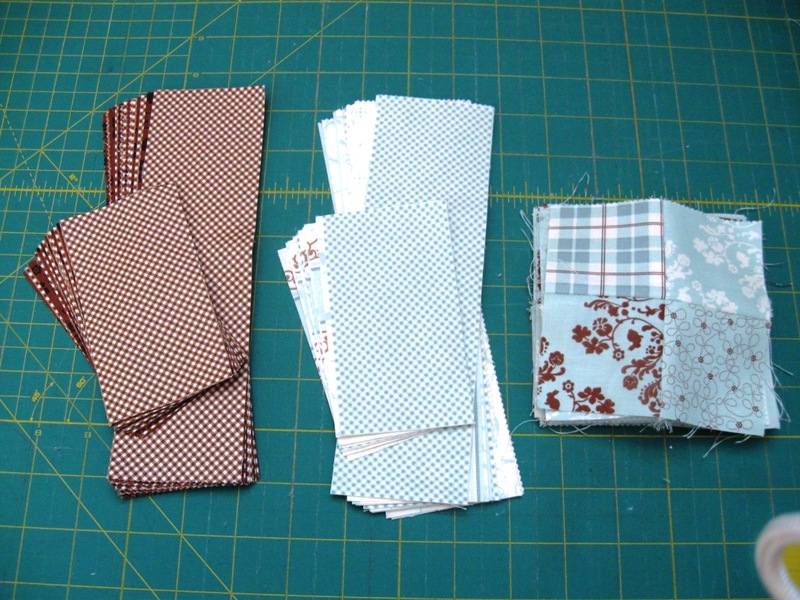 It is pretty much what is left 🙂 The 8 Whiteish strips that are 2 1/2″ x 8 1/2″ and 12 four patch rows, and your newly cut four 2 1/2″ squares. This is the layout for your border. You will be making 4 of these. Layout a 4 patch row followed by the first print of the white strips, followed by a 4 patch row, followed by the second print of the white strips, and ended with another 4 patch row. Now you are ready to add the top and bottom border. This is where those little 2 1/2″ squares come in. 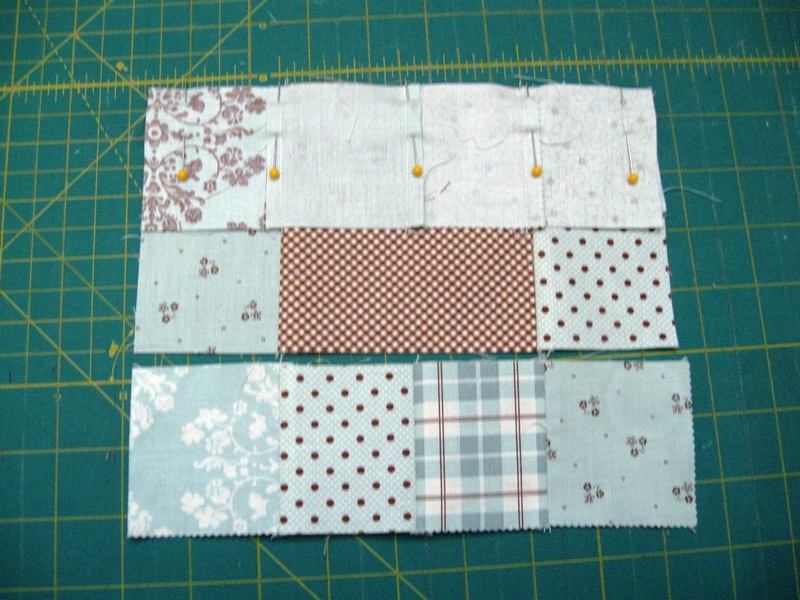 We are going to add them to the ends 🙂 Grab your remaining 2 border strips and lay a 2 1/2″ blue/white check square on the last square of each end with right sides together. 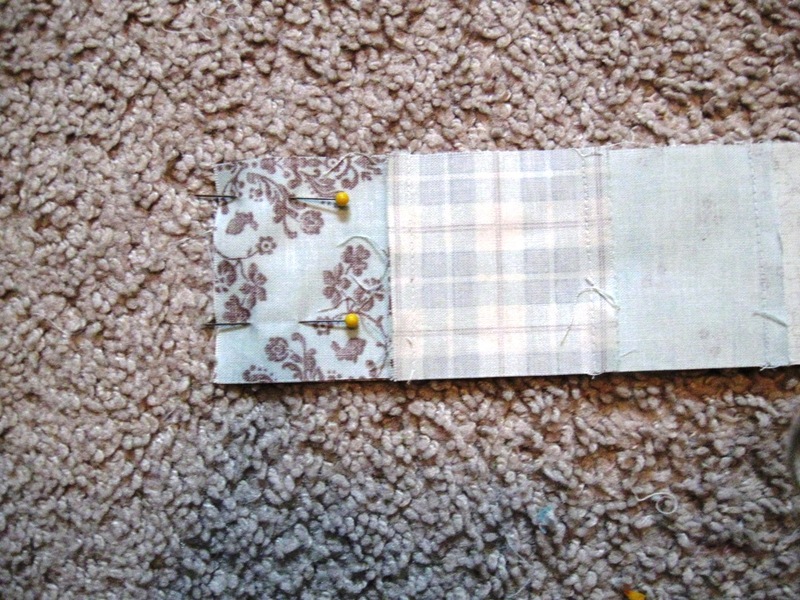 Pin, sew a 1/4″ seam along all 4 ends, and press. Now, to add them to the quilt top 🙂 Almost done, are you just so excited ??? 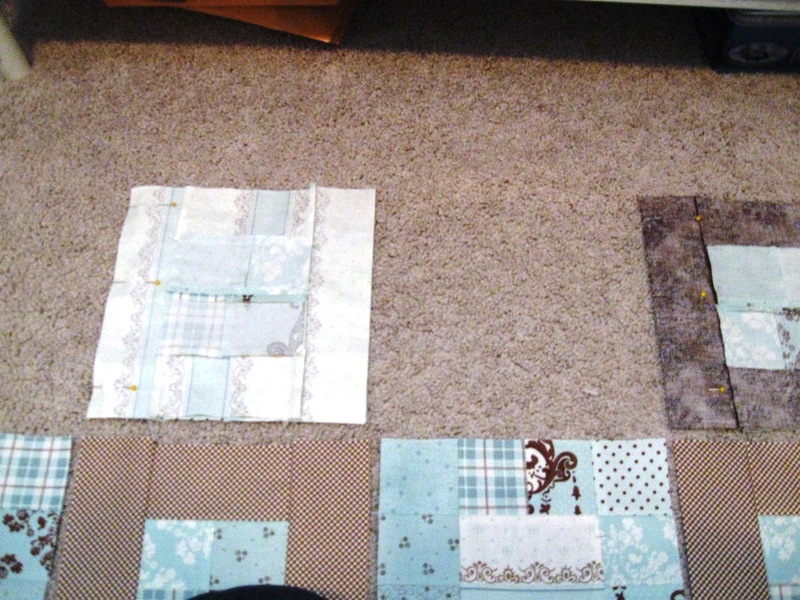 Lay your top and bottom borders along the top and bottom of your quilt top with right sides together. Once again, as you pin make sure to line up your seams 🙂 And lastly, sew your 1/4″ seam along both top and bottom and press. And you have done it!!! 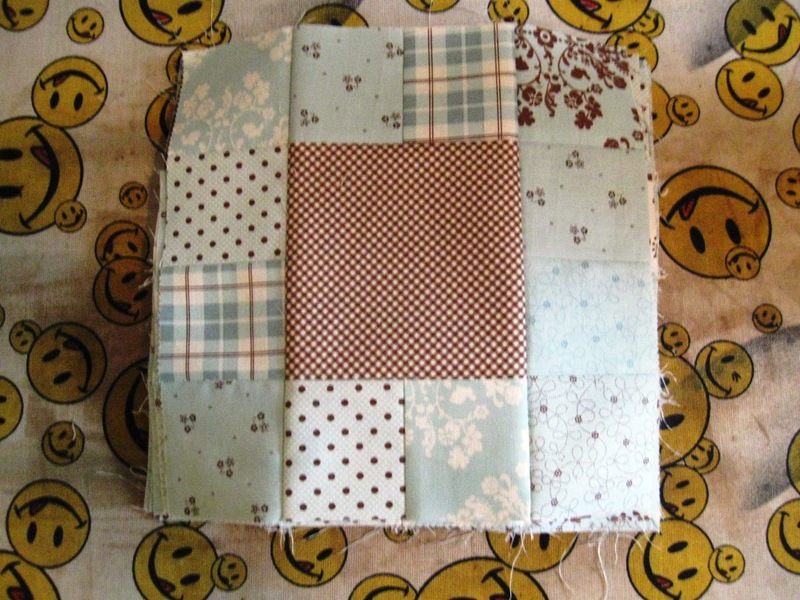 One adorable top that is ready to be turned into one adorable Snuggly Squares baby quilt! And you are ready to put your quilt together. 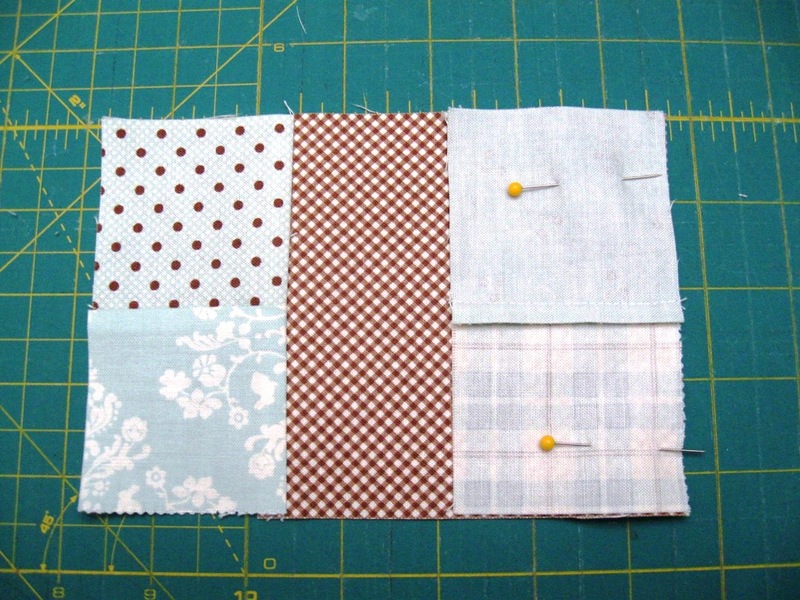 First – make your quilt sandwich. It really helps to tape your backing down onto a wood floor. The backing will be close but you should have enough. 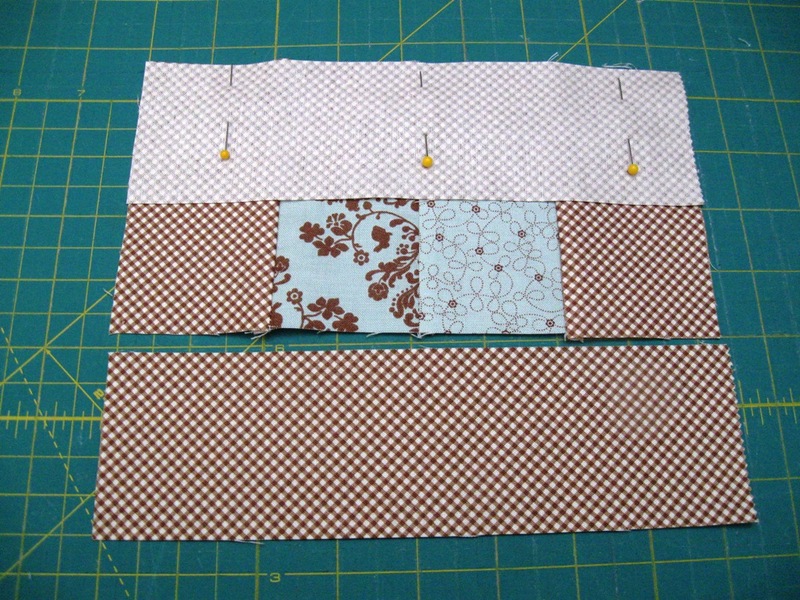 If you find that you did your seams a little small and the top is to big for the back you can always grab some of your scraps and add to your piece 🙂 Baste the sandwich… seriously, the more pins the better. Last but not least, binding. Remember those strips you cut up at the very beginning? It is time for those to make their appearance. 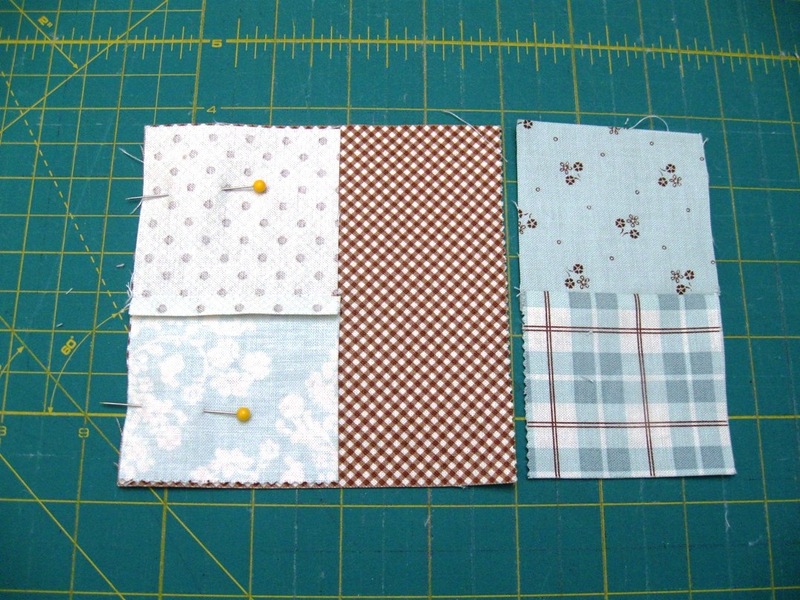 If you are not sure on how to make a binding or attach it there is a great tutorial here. And you are done!! Way to go! Don’t you just love it!!!! 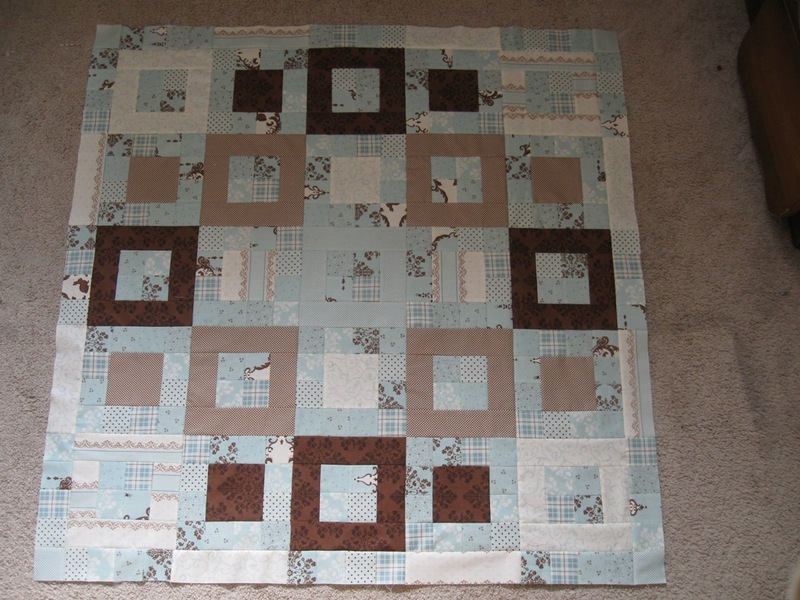 One adorable ready to be cuddled 43″ x 43″ Snuggly Squares II Baby Quilt!! !